Our Kansas basement remodeling contractors will replace materials in your basement that are susceptible to mold growth, such as wooden floors, walls, and ceilings, with mold-resistant materials such as ThermalDry flooring and our scientifically-tested, moisture-free wall panels. Our finished basement systems even include a 50-year mold and mildew resistant warranty to ensure that your family is protected from harmful mold for years to come! We don't simply specialize in mold and mildew removal, however. 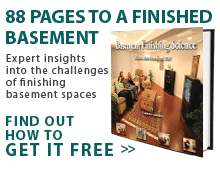 Our experience basement contractors can complete any number of basement remodeling projects. Whether you would like to turn your Kansas basement into a TV room, workout room, bar, or home library, we can get the job done within budget and within a time frame suitable to your needs. To eliminate your basement's moisture problem or transform your basement into a new living space, contact one of our Kansas basement finishing contractors today. We proudly serve homes in Topeka, Wichita, Kansas City, Manhattan, and Colby. Call today to receive your free basement inspection and quote! Whether you live in Kansas City, Frankfort, Topeka, or Chanute, we have a local basement finishing contractor that can help you.